When you decide that you want to transform the look of your concrete driveways, sidewalks, or patio, the team at Bill’s Custom Concrete can help you to create a long lasting and one of a kind look that will be the envy of your neighborhood. One of the most important things you have to consider when choosing a concrete contractor to install your stamped concrete project in the Oklahoma City area is finding a reliable concrete contractor that has extensive experience with stamped concrete. You also have to be familiar with the appropriate sealers and understand how to mix colors effectively. Bill’s Custom Concrete has been installing creative and professional concrete patterns since 1976. Here are some of the reasons you can rest assured that the job will be completed in a timely manner and look incredible for years. Although there are unlimited concrete pattern designs to choose from, Bill’s Custom Concrete specializes in four primary patterns that will transform the look of your property. When the concrete is stamped, you can provide an elegant choice for your concrete driveway, patio or sidewalk. Similar to the grains in wood, the finished result after the concrete is stamped will be unique to your home. When it comes to stamped concrete in Oklahoma City, the team at Bill’s Custom Concrete understand how vitally important it is that the color be mixed properly. Coloring of the concrete is not necessary, but if you do need a coloring it must be prepared properly to last as long as the concrete. One of the features that is exclusive to Bill’s Custom Concrete is our unique pattern that looks like a silver rock, but requires very little maintenance. When a customer chooses the silver rock pattern, the concrete does not have to be colored in order to achieve the desired result. 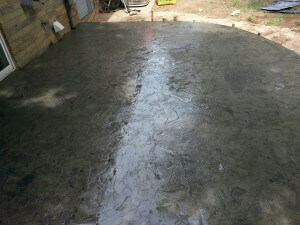 The end result looks similar to a big rock texture, and the concrete does not require any type of sealer once complete. 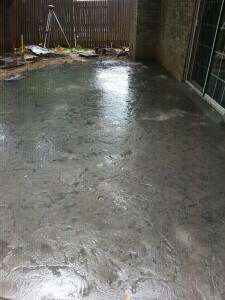 The elimination of the sealer means that the concrete is much easier to maintain to keep clean. 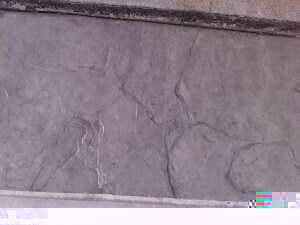 This easy to walk on texture does not require a sealer every three to four years like many other type of stamped concrete would. One of the things that the team at Bill’s Custom Concrete is well aware of is how efflorescence plays an important role in the installation of your concrete driveway, patio, or sidewalk. It is very important that your concrete contractor chooses the appropriate sealer in order to prevent the loss of water through the concrete. Our concrete professionals at Bill’s Custom Concrete understand how making the base at least 4″ thick while using sealers that allow the water to escape from the structure which will eliminate efflorescence from occurring. Our professionals are ready to help you when you decide to transform the look of your driveway, patio and sidewalks. We pride ourselves on providing the best customer service in the Oklahoma City Metro area, and will walk you through the entire process from initial consultation to completed project. In almost 40 years of providing the best stamped concrete in Oklahoma City we have done some incredible work on many of your neighbors properties. Our commitment to high quality work and outstanding customer support is unrivaled. Call one of our specialists today at (405)755-3975 and schedule your free consultation.